A range of two flute cutters for vertical profiling. May be used to produce raised panels as well as for skirtings, architraves, decorative mouldings etc. 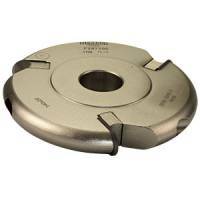 The relatively small diameter of these cutters enables them to overcome some of the problems that occur with the standard design panel raising cutters. Available in 8mm and ½" shank sizes only. N.B. This type of cutter is not suitable for producing panels with curved edges (i.e. arched top panels).